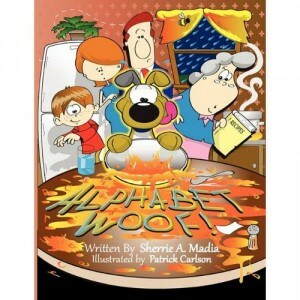 When I first received my copy of the children’s book, Alphabet Woof by Sherrie A. Madia, I noticed a sticker on the book that said that a portion of the proceeds from this book were going to the SPCA. I was impressed because I think it is a great way to buy a book and give back to a worthy cause at the same time! I read the book and I can’t wait to share it with my girls because I thought it was AMAZING! The premise of the story is that Moxy, the family dog, drinks some special spilled soup and suddenly has the ability to talk! The story is quite light-hearted and told in a loose form of rhyme and it talks about the family’s pleasure (and tribulations) of suddenly having a famous pet who can talk! I liked the end of the story because I thought that it brought back the idea that fame is exciting, but sharing time with people who are important to you is even better. I think it had a great message that I want to share with my girls! As much as I liked the story, I absolutely LOVED the illustrations! I think that Patrick Carlson is a great illustrator – the drawings are vivid and cute with a lot of detail and I thought that Moxy was absolutely adorable! I think Alphabet Woof is a wonderful children’s book with great values and amazing illustrations! I would thoroughly recommend it to anyone looking to get a children’s book for someone they love! For some reason, ALL kids LOVE books that rhyme! And I love to read them too! Thanks for the review! I’m a huge dog lover and spend my weekends working at the 24 hr emergency vet clinic. I would love to read this.